In 2005, I developed the drum of my dreams together with Christian Hedwitschak. Christian decided to call it the RWE (Rolf Wagels Edition). 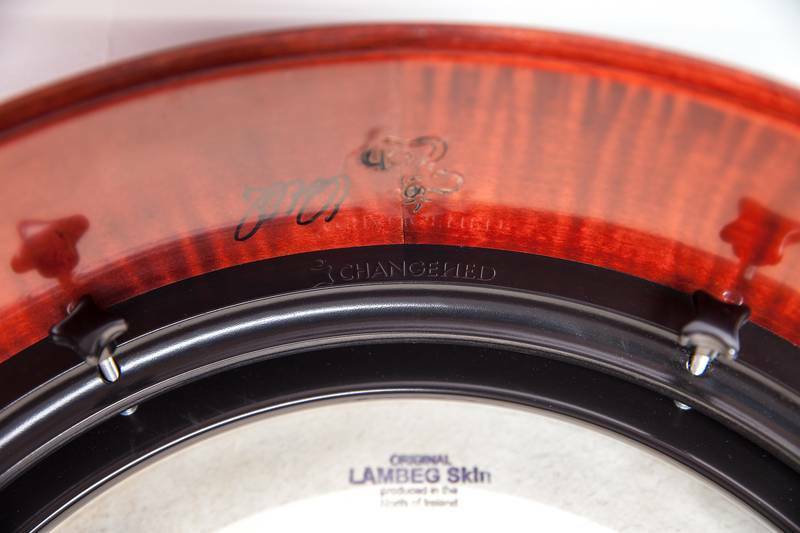 I wanted a Lambeg skin on a my drum, and with the help of Seamus O'Kane we managed to source these skins in the North of Ireland. It was also important to me that the drum features a tool-less tuning system. 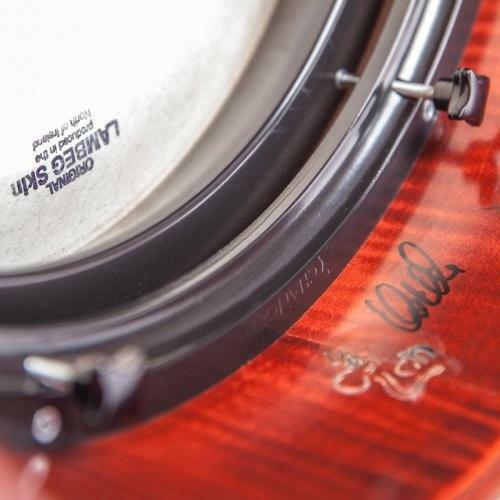 The RWEchange is the smaller model of the RWE, and here, all my demands for a high end drum are fullfilled: Not only a great design with brilliant usabiltiy, but also a universal sound. This means the Lambeg skin works great for traditional playing but also gives the full range for top end style. The Lambeg skins are produced using methods refined over centuries by Tommy Louden in the North of Ireland. For the RWE we choose homogeneous, not too thick skins, mostly without spine. (In some cases we use skins with the spine, but only if the spine is thin and unobtrusive). The skin reacts quickly and has a great range of tones. The attack is very present, esp. compared to a softer skin like a DragonSkin. This means the RWE-Lambeg skin works great for traditional playing but also gives the full range for top end style. It's a lively drum, easy to change tones, and gives a lovely feedback to the stick and to the player. Great attack and enough overtones for harmonic playing, but not too many overtones that wouldn't allow the occasional open bass playing.. It's a lively drum, easy to change tones, and gives a lovely feedback to the stick and to the player. Great attack and enough overtones for harmonic playing, but not too many overtones that wouldn't allow the occasional open bass playing. The innovative compressor tuning system, the ChangeHED skin holding system and the isolatHED technology make this drum unique. The ChangeHed skinholding system allows to easily change the head and the tuning rim of the drum. This opens a lot of new possibilities: Christian Hedwitschak offers a great variety of tuning rims and skin types on his website. which all fit on the RWEchange. For example you can get a DRAGONSkin®spicy with a red ribbon and silver nails for a RWE main frame, an additional spare deer skin without decorative nails, another EdlauerSelect spare skin just taped without decorative nails, another spare TwinSkin skin with a black nylon ribbon, and another transparent synthetic spare skin with a black nylon ribbon. These are only a few ideas, there are a lot more possibilities. The ChangeHED skin holding system is explained here in detail. With the isolatHED technology all contact points of the tuning screws are decoupled acoustically. 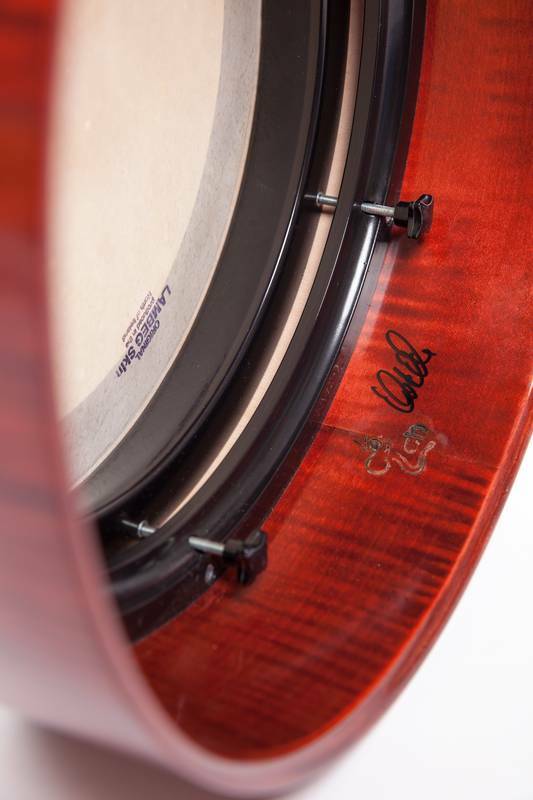 This means that the tuning rim is now the only component still in direct contact with the drum skin. 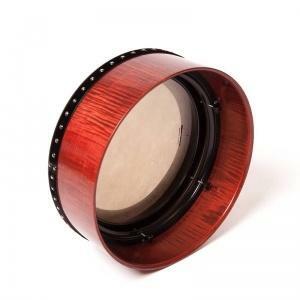 The result is a drum inside a drum, so to speak: First, there is the outer frame, which is in contact with the player’s body, holds the drum skin, and supports all components of the tuning system. Second, there is the independent tuning rim, which takes the sound off the drum skin like a pickup or a bridge. As a result, the brilliance of sound is significantly improved, and the frequency spectrum becomes much more homogeneous. As less energy is absorbed by the main frame, there is also a measurable increase in loudness. All details can be found here. The compressor tuning frame that comes with every RWEchange is a funnel shaped, relatively high tuning rim which influences the overtones and the overall frequencies of the bodhrán in a positive way. Drums fitted with the compressor rim show a more defined, clear and dry sound compared to a classical tuning system, therefore these drums can be heard better when mixed with other instruments without being loud or obtrusive. The compressor tuning frame performs offers superb qualities for studio and stage. Everything about the compressor tuning frame including studio tests, can be found here. The smaller diameter makes this drum accesible for smaller players as well. I prefer the smaller diameter myself, as the skin hand needs less travel and the sound is more compressed. Every single RWE drum goes through my hands to ensure top quality. It carries my name, so I want to make sure all the drums are in brilliant shape and sound the way I would expect it. The RWE is a high end classic drum that established itself in the international bodhran scene in the last couple of years. By now, people like Eric Cunningham (Frankie Gavin & DeDannan) Kieran Munnelly (Dave Munnelly Band), John Joe Kelly (Flook), Eamon Murray (Beoga), Jimmy Higgins (Altan & Lunasa), and Stiofan O'Brion play the RWE regularly. The Lambeg skin will settle in the first 3-6 months, depending on the skin and how much you play. You will notice now that the skin reacts quickly to weather changes and even if somebody opens a door, it will react. This will stop once the skin has settled. Also, you will get more bass over the next couple of months. Sometimes, these changes are gradually, but esp. with the Lambeg skin, the change may occur from one day to another.